Monitor development towards HDR as a more widely-used standard is finally getting into gear, to the extent that a number of HDR panels have been announced in recent weeks. The latest, revealed this week and scheduled for release later this year, is the Philips Momentum 436M6VBPAB developed by MMD that supports VESA's DisplayHDR 1000 standard, UltraHD resolution, and Adaptive Sync Technology for gaming on PC and XBOX One. Headlining the 436M6VBPAB's feature list is certification for VESA's DisplayHDR 1000 specification, necessitating a maximum brightness of 1000cd/m^2 (1000nits). To both facilitate this and retain adequate contrast characteristics without using OLED technology, the MVA panel incorporates 32 localised dimming zones and lists a static contrast of 4000:1. Colour support is a robust 97.6 percent of the DCI-p3 color space, augmented by a quantum dot filter on the panel. The panel supports 10-bit (HDR10) colour addressing, implemented using 8-bit+Frame Rate Control to represent a wide colour gamut on-screen. The panel's refresh rate is stated to be 60Hz, but no concrete information is given of its refresh rate range. In order to support FreeSync's optional Low Frame Rate Compensation technology it would need a maximum refresh rate of no less than 2.5x the minimum, or a range of 24-60Hz. 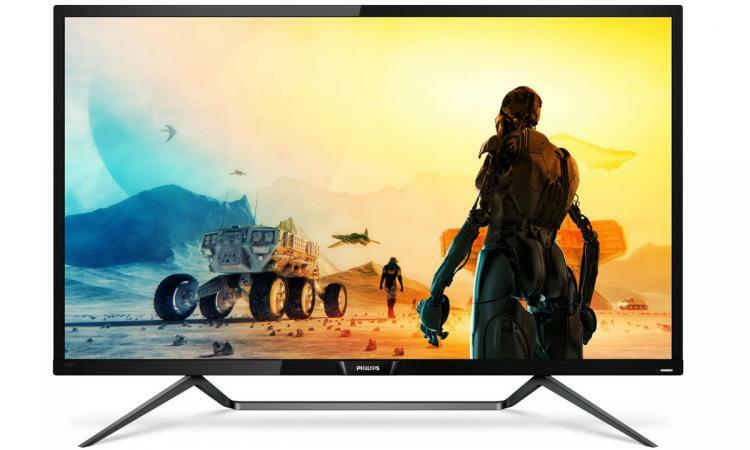 It's possible however that the panel will be restricted to a more common 40-60Hz refresh rate window, but our hope is that a wider range (perhaps even from ~25-75Hz) is on the cards. Video I/O is the by-now standard suite of HDMI 2.0, miniDisplayPort 1.2 and standard DisplayPort 1.2. USB-C, with a DisplayPort alternative mode, is also part of the feature list. The monitor can act as a two-port USB 3.0 hub, including charging capabilities. 3.5mm audio in/out is also offered, making use of the display's dual 7W speakers. One eye-watering figure of note is that the monitor lists a typical power draw of 162W. Putting that figure into context: a single NVIDIA GTX 1070 graphics card has a TDP of 150W, so I have no doubt that monitor reviewers will be taking a much deeper look at where all that juice goes. The monitor is intended to appeal to console gamers in particular, no doubt due to the recent roll out of FreeSync 2 beta support on the XBOX One X, as well as FreeSync on the original XBOX One. No information has been given as yet on availability dates or pricing.